Do this as soon as you read this. The first of many steps to selling a co-op in NYC involves you investing a few hundred dollars in some stunning architectural home photography. The reason you want to order a photoshoot ASAP is because your photograph’s next availability might not be for a few days. Furthermore, it can take a couple additional days for your photographer to digitally edit and enhance your photographs. Unless you already have a photographer in mind, we recommend ordering Hauseit’s professional photography service. We have the best local real estate photographers on standby who can be at your home the very next day. If you already have a floor plan handy which you own or have permission to use, you’re all set! Be careful about just downloading a floor plan of your property you find online. It may belong only to the listing agent who ordered the floor plan drawn for a previous sale of your property! You should email the listing agent for permission to use the floor plan. If you can’t get permission or would rather not contact the agent, you can always order a new floor plan to be measured and drawn by a professional draftsman or architect. 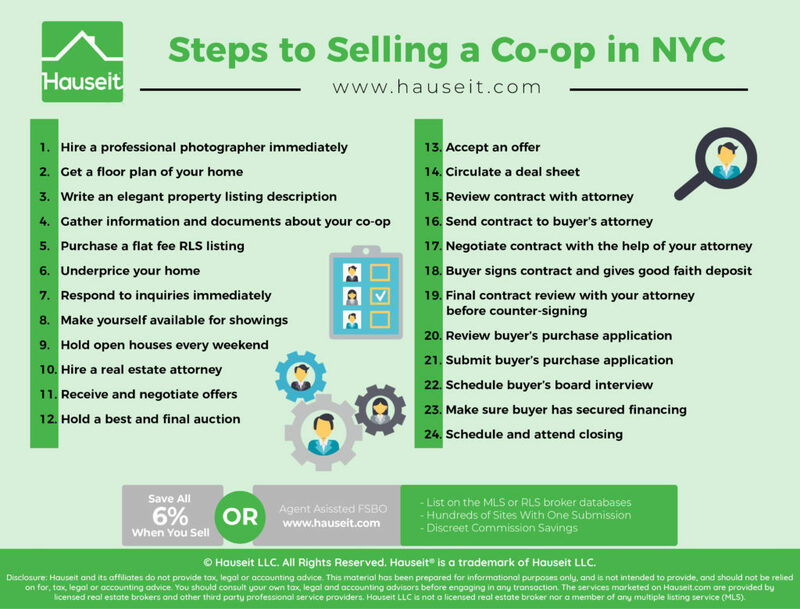 This is an important second of many steps to selling a co-op because 50% of buyers will not visit a property without first seeing a floor plan. This step is relatively straightforward and should be easy for you since you are a co-op apartment owner in NYC. Make sure it’s concise with no spelling or grammatical errors. The first part can be about the apartment itself and the last part can be about the building and amenities. It’s tempting to write too much but do your best to keep it short, sweet and to the point. Pro Tip: Do not use the word “office” in your description as certain sites like StreetEasy strictly prohibit commercial listings. If your property doesn’t have a washer or dryer, avoid putting those words or even “W/D” in your description unless you want it to show up as a feature on your listing on StreetEasy. Certain websites will automatically detect and add features to your listing based on the words in your description. Many of these documents you will be able to find in your inbox from the time when you purchased the apartment. If it’s been too long, feel free to ask your real estate attorney for your original purchase of the apartment or building management. 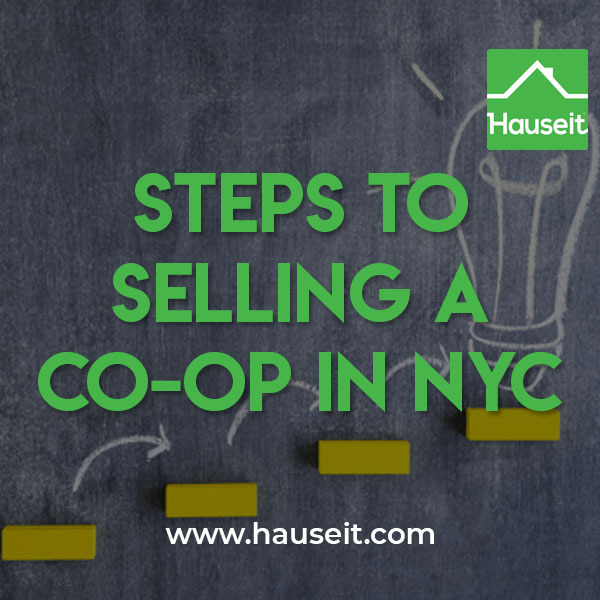 You won’t need everything yet to be able to proceed to the next of many more steps to selling a co-op in NYC. Many of these documents will only be requested by the buyer’s attorney during due diligence after an offer has been accepted. This is the secret weapon that 50,000 agents in NYC don’t want you to know. The reason you need an agent to sell your home is because 90% of all buyers are represented, and the only way to engage represented buyers is by listing your home on the RLS, or REBNY Listing Service which functions as the equivalent to the New York City Multiple Listing Service. However, what agents won’t tell you is that you don’t need to pay 6% commission just for this exposure. You can save up to all 6% by listing with a flat fee RLS listing through Hauseit. If you sell to an unrepresented buyer, you’ll truly save all 6% in broker commissions. If you end up selling to a represented buyer, you’ll only owe the commission offered to buyers’ agents in RLS (typically 2-3%). Miss 90% of represented buyers. Broker harassment. Save up to 6% in commission. Full buyer exposure. Traditional full service without the traditional commission. Lose 6% of your sale price. Conflicts of interest. As the heads of the largest traditional brokerages in NYC have openly admitted at conferences, a listing will sell at the right price no matter who lists the property. Because you’ll have a rather lenient listing agreement through a flat fee RLS listing, you will have the luxury to under-price your apartment relative to comparable homes on the market and attract significantly more traffic. At the end of the day, everyone is looking for a deal. You will almost certainly attract more inquiry and unrepresented buyers by slightly under-pricing your property. Direct buyers sometimes won’t wait for their buyer’s agent if they see a good deal! Why is this good? Because any rational property seller would rather have more interested parties than less. Having more buyers at your open house fosters a competitive spirit and will much more likely lead to you being able to hold a best and final auction with multiple bidders. Warning: Traditional Exclusive Right To Sell Listing Agreements are extremely onerous. They contain language that coerces you to pay 6% commission as long as a “ready, willing and able” buyer is found at your listing price, even if you decide to back out and not sell! Learn more in our article about whether a seller can back out after accepting an offer in NYC. This is extremely important and something most FSBO sellers don’t take seriously to their detriment. It is a cardinal rule for real estate agents that you should respond to leads within 10 minutes of receiving them. This is especially true when it comes to calling back a lead who has provided a phone number. The buyer will be much more likely to answer a call from an unknown number shortly after providing their phone number. If however, you decide to call back a couple of days later, the chances of them picking up your call will be dramatically reduced. No one likes to pick up calls from unknown numbers these days! If you’re serious about saving commission and doing this yourself then you’ll need to follow this next of many steps to selling a co-op very diligently. Many FSBO sellers believe it’s okay to push back on showing requests and only show when it’s very convenient for them. Unfortunately for them, the buyer market is usually not as deep as they think it is. This is especially true for higher priced units above $2 million where many buyers are international or from out of town. For luxury units, you will often encounter international buyers who are only in town for one day. If you decline to show the apartment because it’s inconvenient for you, then you’ve eliminated a serious potential buyer in a buyer pool that is not as deep as you may believe just because your home is in NYC. After all, there are only so many people who can afford a multi-million dollar apartment. If you have a busy work schedule that prevents you from weekday showings, we highly suggest you consider our Full Service for 1% listing option. You would enjoy the benefits of a traditional, fully agent managed sale listing without paying the traditional 6% commission. This is especially important during the first month of your listing when it is fresh. If you can only do one open house on the weekend, try to host for at least 2 hours between 12-4pm on Sunday when there is most traffic. If you really have time to devote to this, host a 2 hour open house on Saturday as well. If you wanted to take it one step further, try hosting an open house during the week after work between 5-7pm. Pro Tip: Look for other open houses in your building and post your open house at the same time to take advantage of the cross traffic. While not legally required, it is absolutely essential to have a good real estate attorney to help you review and negotiate the purchase contract. New York City is different in that the purchase contract is more complex and customizable with various contingencies to be negotiated. You will need a good lawyer to help you navigate this process. If you’ve done all the prior steps to selling a co-op, you should be receiving multiple offers by now. Encourage all offers to be made formally by email and be comprehensive in nature. That means the offer email should include a completed REBNY Financial Statement, pre-approval letter if they’re financing, proof of funds if the buyer is purchasing all cash, a short biography as well as the buyer’s attorney contact information. Remember that negotiating an offer in real estate has zero similarity to trading bonds at an investment bank. You can give an offer one day and retract it the next. You can accept an offer at one level but change your mind the next minute with no repercussions. Nothing is final in real estate until a contract is fully executed by both parties of the transaction. Assuming you’ve followed our steps to selling a co-op diligently and under-priced your apartment, don’t be surprised to receive multiple offers from different interested buyers. All of them will want information from you on where they stand among the competition. Just remember that you have zero obligation to tell them anything. Of course, if you’re up for some salesmanship, you can tell them as much information as you’d like if you think it will get you a higher offer. The most fair and easiest way to deal with multiple bidders is to ask everyone to submit their best and final offer at a certain time. This way, everyone will have one last chance to put their best foot forward and ideally submit the highest price they would be willing to pay. 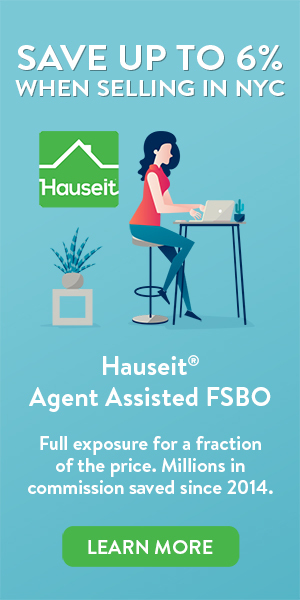 Learn more about the NYC FSBO closing process and what a full offer submission should contain by visiting our award winning blog! After you’ve reviewed all of your offers, it’s time to select the most qualified buyer based not just on price, but on likelihood to secure funding for the deal and likelihood to be approved by the co-op board. Unlike a condo sale where there is no board interview, you need to seriously consider the fit of the buyer with the building. Co-op boards hold an extraordinary amount of power and have complete discretion on approving buyers. Warning: Co-op boards have no legal requirement to disclose the reasons for a buyer rejection. Co-op boards have been suspected of rejecting otherwise very financially qualified buyers due to discriminatory reasons such as race, disability, nationality or sexual orientation. Unfortunately these cases are very hard to prove because there is no requirement for the co-op board to disclose its reasons for rejection in the first place. Note: You can formally file a complaint against a co-op for discriminatory practices here. Once an offer has been accepted, the listing agent traditionally sends around a transaction summary (i.e. Deal Sheet) to the lawyers and brokers on both sides of the deal. The purpose of this is to put the lawyers in touch with each other and also to provide a high level summary of the deal including price, contingencies, any inclusions or exclusions as well as everyone’s contact information. Your real estate will draft a purchase contract and review key provisions with you before sending it to the buyer’s attorney. It’s important to have a competent real estate attorney explain the closing process, closing costs and go over the contract with you. Your attorney will explain what various contingencies the buyer may ask for mean. Warning: Your broker is not responsible for reviewing or negotiating the contract on your behalf. Doing so is an illegal activity called the “unauthorized practice of law.” You should work closely with your attorney at this stage of the process as he or she will be in charge of the closing process from your side. Your attorney will typically messenger the contract to the buyer’s attorney offices. If you’ve followed our steps to selling a co-op correctly, you should have multiple buyers in backup. As a result, you may be able to credibly demand the buyer to sign the contract within a certain amount of time. Note: While it is not commonly done, sellers have been known to send contracts out to multiple accepted offers simultaneously. This can happen in a seller’s market with great buyer demand. While it may not sit right with buyers’ agents, there is nothing illegal about the practice. At this stage the buyer’s attorney may have come back with some requested changes such as adding in a contingency based on the loan appraisal value. Your lawyer will guide you through the changes, advise you on how to best proceed and negotiate on your behalf with the buyer’s attorney. After the contract has been negotiated and the language agreed upon by both parties, the buyer will meet with his attorney and sign the contract. The buyer will also write a check for 10% of the purchase price, typically called the “good faith deposit” at this stage. The buyer’s attorney will then messenger the signed contract and good faith deposit to the seller’s attorney. Contracts are still signed by hand, the old fashioned way, in New York City. So you’ll need to go to your attorney’s office for a final review of the contract before fully executing the contract. As the seller, you have flexibility on when you want to counter-sign the contract. The buyer has less flexibility since he or she has already signed the contract. However, as the seller you are free to accept a higher offer at any point prior to fully executing the contract. This is optional if you are selling your home yourself; however, a listing agent will traditionally review the completed purchase application before it is submitted to the building management company. This is duplicative in a sense because the building management company will let everyone know if something needs to be corrected in the application. The building management company will only submit the application to the board once everything is correct. The point of the listing agent review is to make sure that there are no egregious errors which will get rejected by the management company. The point of having the listing agent review the package first is really just to save time in potentially going back and forth with corrections. If a buyer’s agent has already reviewed the application, it can be duplicative to review it a second time. With that said, it’s still a good idea to review some common tips for preparing a co-op board purchase application that will go through the first time. Note: The point of this exercise is not to be nitpicky and pretend you are an investment banking Managing Director going over a first year analyst’s presentation. Your role is not to point out every misplaced comma or minor misspelling. Please be courteous and thoughtful. There is no set rule as to who should submit the finalized purchase application to the management company. Often times, listing agents are happy to review the board package themselves and then messenger or express mail it directly. Other times, you may trust the buyer’s agent enough to not need to review the application in which case you can ask the buyer’s agent to messenger it directly to the management company. Once the building’s management company has signed off on the buyer’s purchase application, submitted it to the board, and received conditional approval from the board, they will inform the brokers of a proposed board interview date. Because there are multiple people with busy schedule on the board, it is not wise for the buyer to request a different time from the one given. As a buyer, you only have to do this once, so just accommodate the time they give! At this stage, you can only wait to hear from the buyer on the status of their bank financing commitment. The buyer should have secured a commitment letter at this stage. Once the buyer has a clear to close from the bank you can set a firm closing date. Congratulations on completing all of the steps to selling a co-op in NYC! At this stage, you can let the lawyers on both stage schedule and handle the closing. Closings are typically held at the building management company’s offices for co-ops. This is in contrast to condo closings which typically occur at the seller’s attorney’s offices. On closing day, you can expect to see some familiar faces. You, the buyer, your attorney, the buyer’s attorney, a closing coordinator who is also often a notary, the buyer’s bank’s attorney if the purchase will be financed, the seller’s bank’s attorney if there is an outstanding loan on your co-op and the brokers representing both parties. Note: Don’t expect to always see the brokers show up to closing. They don’t have an actual role in the closing itself except for picking up their commission check. As a result, if they do show up it will be purely as a courtesy and for moral support for their client. Brokers often don’t show up to closings at all and pick up their commission check from the seller’s attorney at a later, more convenient time. Ironically, brokers are the least important among the steps to selling a co-op at closing.